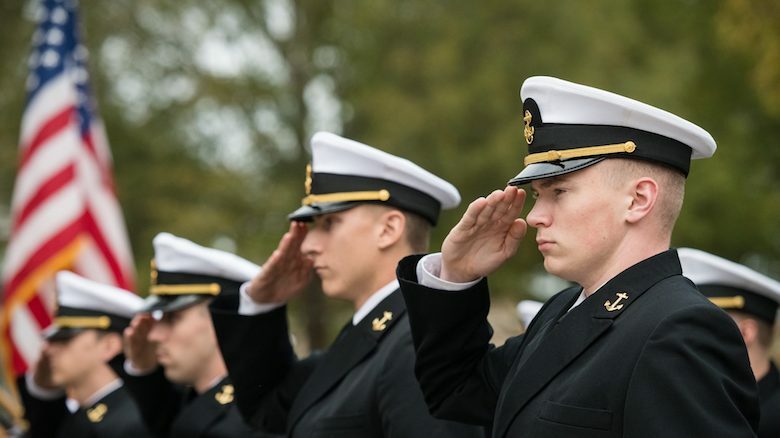 Scores of cadets and midshipmen stood steadfast at attention for inspection Thursday (Nov. 8) in front of the Lyceum during an annual tradition designed to demonstrate the discipline and training they have received as ROTC students at the University of Mississippi. Cadets and midshipmen from the university’s Army, Navy/Marine and Air Force ROTC programs dutifully followed commands from their squad leaders as they awaited the Chancellor’s Pass in Review, an annual event that has a long history in the military and at Ole Miss. Vitter acknowledged the sacrifice inherent with signing up for the Reserve Officer Training Corps. “It’s an honor to be standing here today amongst a group of heroes – our students – whom have put aside their personal interest for the sake of serving something larger than themselves,” Vitter said. The chancellor noted that the university and its ROTC programs have a storied history of service to the state and the nation. The Pass in Review event has been conducted annually since the inception of the ROTC programs. The ceremony is a tradition that gives a commander an opportunity to inspect troop readiness. “The fact that Chancellor Vitter and the Ole Miss family chose to celebrate this important event with us is testament to the great support we receive and the great relations we’ve developed with this community,” Beaver said. Vitter acknowledged the accomplishments of each branch before inspection. Army ROTC was established March 11, 1936 at UM. “Under the direction of professor of military science Lt. Col. Josh Taylor, the Army ROTC mission is to develop leaders of character, imbued with the warrior spirit, for all components of the Army: active duty, National Guard and Reserves,” Vitter said. As of August 2017, more than 1,760 cadets have received commissions through UM Army ROTC. Vitter recognized retired Col. Bobby Towery, president of the Ole Miss Army ROTC Alumni Board, along with many other distinguished veterans in attendance. “I want to thank all the veterans who are here today who answered our nation’s calling in a time of need,” he said. Vitter touted the university’s naval ROTC as pioneers in accepting women into the program. “In 1972, four years before women were accepted into the Naval Academy, the first women were accepted into the University of Mississippi naval program as midshipmen,” he said. The Navy ROTC is under the direction of Capt. David Neal. UM is among 77 colleges in the nation with Navy ROTC programs. Vitter recognized the emergence of the Air Force ROTC program in 1947, and highlighted its evolution into today’s Department of Aerospace Studies, under Beaver’s leadership. “The UM Air Force ROTC program has over 375 graduates who have served in many positions of responsibility and earned numerous academic and military achievements,” he said.